Many people have artistic or creative talents, but don't know how to develop their talents into skills, which can help them earn a living. 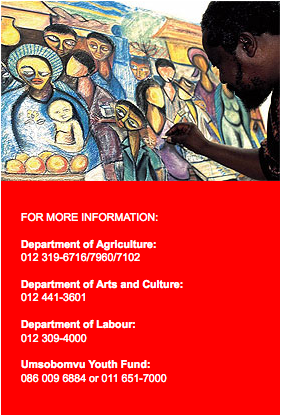 The Department of Arts and Culture is reaching out to such people through different projects. One such programme is the Mosadi wa Kono Kono campaign, which helps women with skills training in arts, crafts and cultural development in rural areas. It finds and helps women who show the ability to be leaders, especially in the poorest of communities. The programme has already been started in six provinces. Another programme is the Arts Access to All Communities project. This programme helps people to get training in the arts in all communities, especially children, women, people with disabilities, as well people in correctional centres. So far, the programme has funded the training of 20 community arts counsellors. A further 12 community arts counsellors will have their training upgraded. When they complete their training, the graduates do their internships in community facilities. They are then placed with Community Art Centres. Community Art Centres directly bene-fit members of the targeted communities. They offer skills development programmes in things like music, craft, heritage and sewing. The Community Art Centres also run Women Entrepreneurial Skills Training Centres. These centres focus on training women in things like computer literacy, entrepreneurship, business and financial management. The Department of Arts and Culture has other ongoing skills development programmes like the National Youth Expressions Campaign. 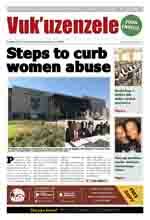 It targets young people and provides skills training and employment opportunities.